In the area known as Town Neck, along the shore of Cape Cod Bay, a lens of fine clay suitable for brick-making was discovered, perhaps as early as 1790 when construction of houses and mills picked up in earnest. 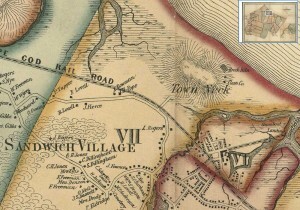 1857 Map by Henry F. Walling (Click for Larger View)Map Reproduction Courtesy of the Norman B. Leventhal Map Center at the Boston Public Library. 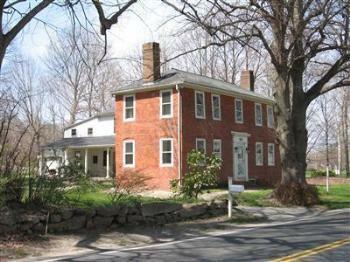 In 1815 a brick house was built at 100 Tupper Road and to this day is the only brick house in Sandwich. It is said to have been built by Simeon Leonard, then the owner of the Town Neck brickyard. Lovell writes: “In 1819 the town appointed an officer whose title was ‘Surveyor of Brick. '” Although there was only one brick house, the yard provided foundation materials for many Federal period buildings throughout the town. The first deed referring to the brick kiln so far known is dated 1828 when the owners were David Benson and Simeon Leonard. The property was two acres bounded by the shore to the east, private land at the marsh, and by the proprietors’ lands. Deming Jarves was the main principal of the glass company until 1858, when he resigned over a dispute with its Board of Directors. Deming and his son, John, began another glass company just down the street called the Cape Cod Glass Works. At least 500,000 bricks needed to construct the buildings and chimneys of this new factory mere made at the Town Neck yard. When the “Pot Room” of the Boston and Sandwich Glass Factory was torn down in 1937, its bricks were used as facing for a new building being constructed on Main Street in Hyannis for the Cape Cod Standard Times (today’s Cape Cod Times). This entry was posted in Glass Factory, Industry. Bookmark the permalink.